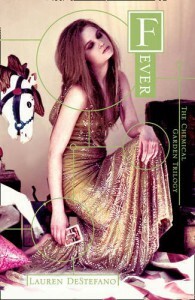 I've been meaning to read Fever for a while since I forgot to buy the book (it's either that or I refused to fork out about £10 for a hardback copy because I'm cheap like that) but the recent cover reveal for Sever reminded me that I really need to get my bum in gear and read this. Thankfully, my library had it so I tore it off the shelves straight away and took it home. Although I liked seeing Rhine and Gabriel together more, there still wasn't any strong chemistry with them and it seemed like they were both in the friend zone. It appeared to me that Rhine had some lingering feelings for Linden and wanted to be back at the mansion, due to her constant reminiscing about him climbing into her bed and being with her sister wives. I liked seeing Gabriel come out of his shell but while he did that, Rhine appeared to become weaker, to me and I don't mean just physically. In Fever there are many more locations and settings than Wither, as Rhine and Gabriel are travelling from Florida to Manhattan. I've never been to the US and I have very little of it's geography but I'm assuming that's a long way to walk or travel by car. I enjoyed seeing the numerous settings as it made the book feel much more free, whereas Wither felt almost claustrophobic. Throughout the book, there are references to Vaughn, Rhine's malevolent father-in-law. I felt that these references and even appearances gave the narrative a feel of danger and of fear of being caught. Every time Vaughn was even mentioned I found myself routing for Rhine and Gabriel to complete their mission but I had a bad feeling that they wouldn't. I found the writing of Fever to be a bit better than that of Wither. I loved the imagery and descriptive language that was used, especially during Rhine's dream sequences, hallucinations and when she is drifting in and out of consciousness. I like to have a good image of whatever crazy things a character is seeing and DeStefano captured those crazy things incredibly well. Overall, Fever is an improvement on Wither but it's not completely perfect. I enjoyed the dark, kind of hopeless feeling that is present throughout the book but sometimes it got a little bit too much. But, that aside, this is a great sequel and I can only hope that it gets even better from here!